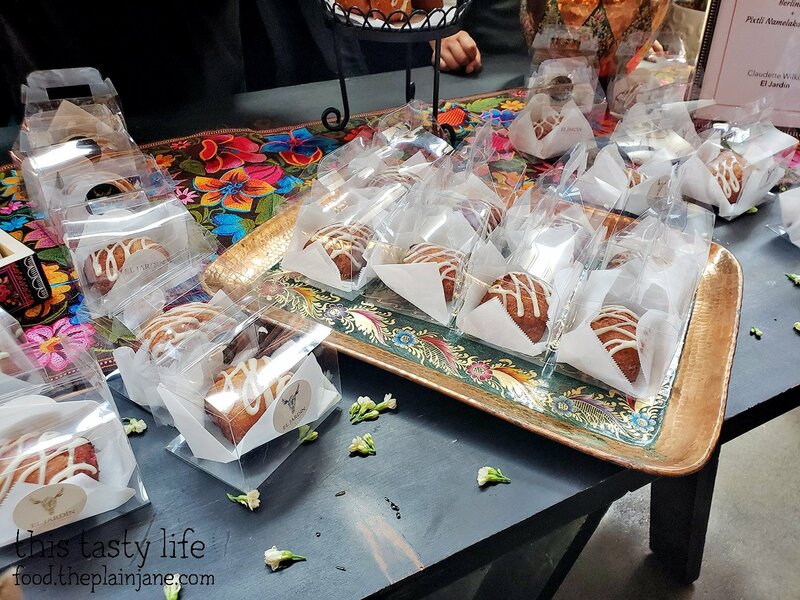 This weekend was the Chef Driven Bake Sale, held at Herb & Wood in Little Italy and put on by Friendly Feast. This bake sale has been going on for a few years now and I’ve always missed out on it… until THIS YEAR! I decided to finally take the plunge and go for it! I got a special ticket that allowed you to choose 5 treats for the price of $40 (which included admission and a special little treat). All of the money goes to charity to support the Monarch Schools so I didn’t feel TOO BAD about getting a bunch of desserts. After checking in for the Chef Driven Bake Sale, I got my little paper bag and was ready to check out all of the desserts! Jake and Maya were waiting for me in the car so I tried to be quick about my visit. 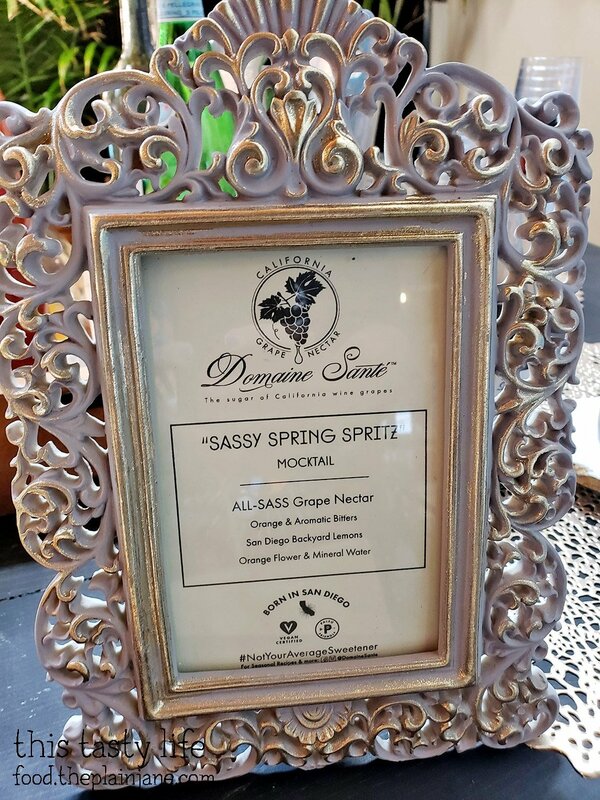 They had these cute refreshing little mocktails using Domaine Sante. I also received some Domaine Sante in my bag as a gift. I had never heard of this stuff before! The mocktail was quite refreshing. 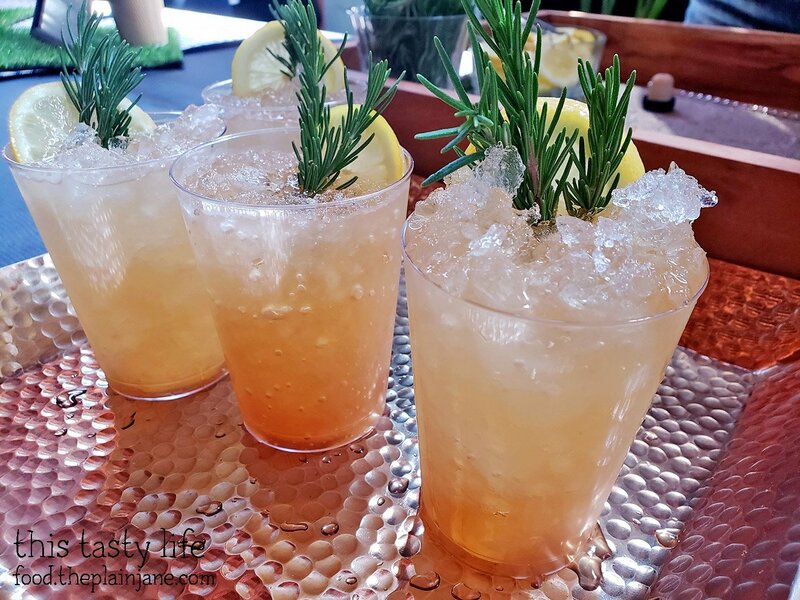 The rosemary enhanced it just by being in the glass – more of a flavorful smell to go with it while you’re drinking the beverage. 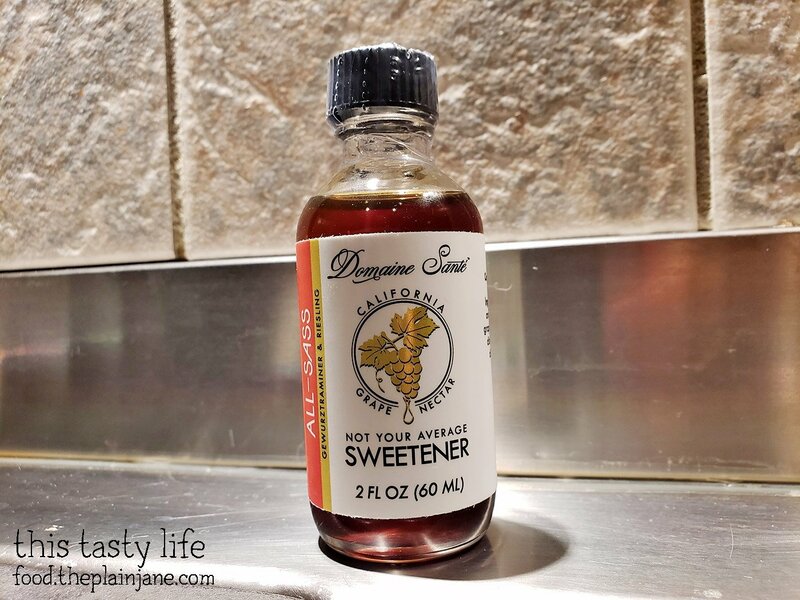 A peek at the bottle I received from the Chef Driven Bake Sale. No idea what I’ll do with this but I’ll think of something! 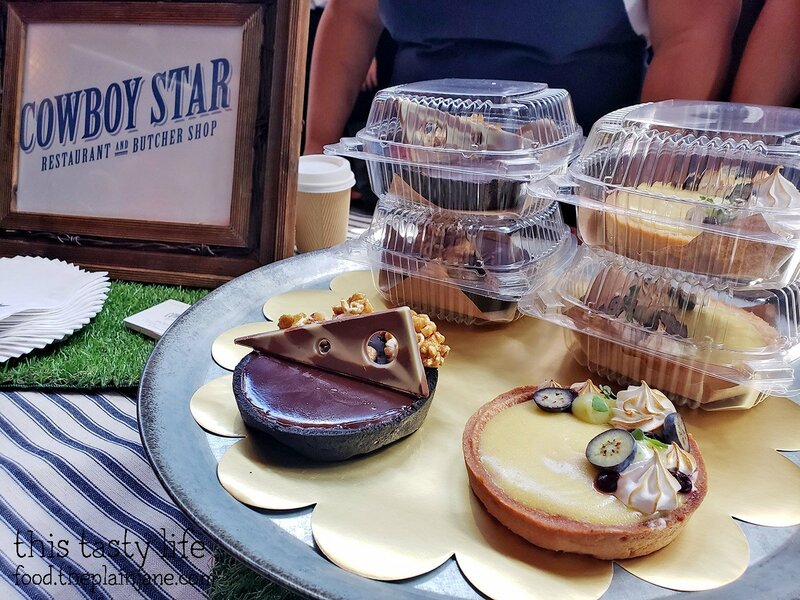 One of the first tables I passed by at the Chef Driven Bake Sale was from Cowboy Star. 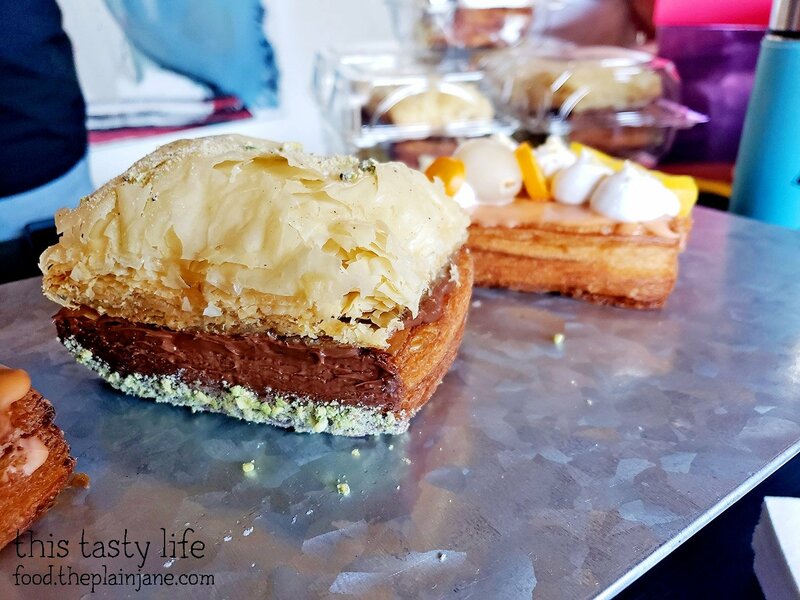 She has two different tarts available – one chocolate and one citrus using calamansi. I know of calamansi because my mom uses it in her cooking at home but I hadn’t seen it used in a tart before! It’s kind of like a key lime or lemon tart. 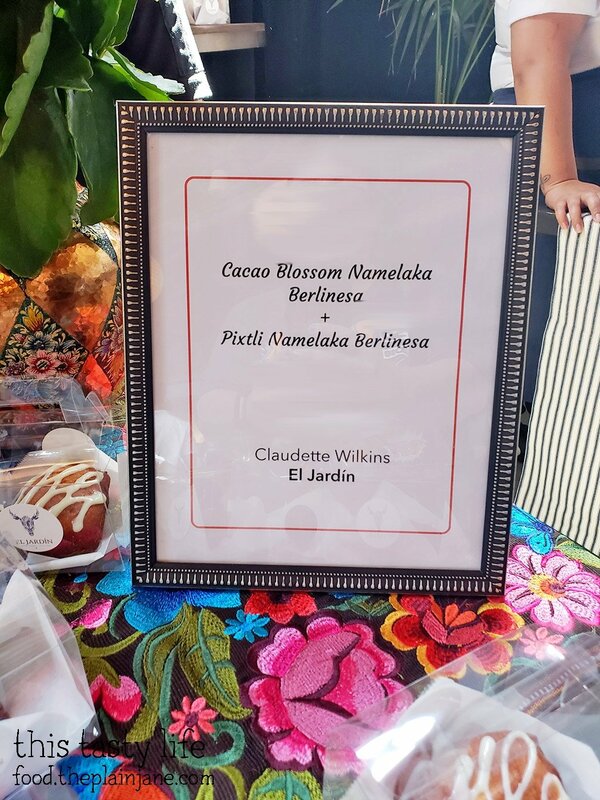 The next offering was from the chef at El Jardin. They explained to me what this was and for the life of me, I can’t remember what they said. Google tells me that “Berlinesa” is a term for “Berliner, a fried dough”. And Namelaka is a Japanese work for “ultra creamy” and possibly a creamy paste. So there you go. 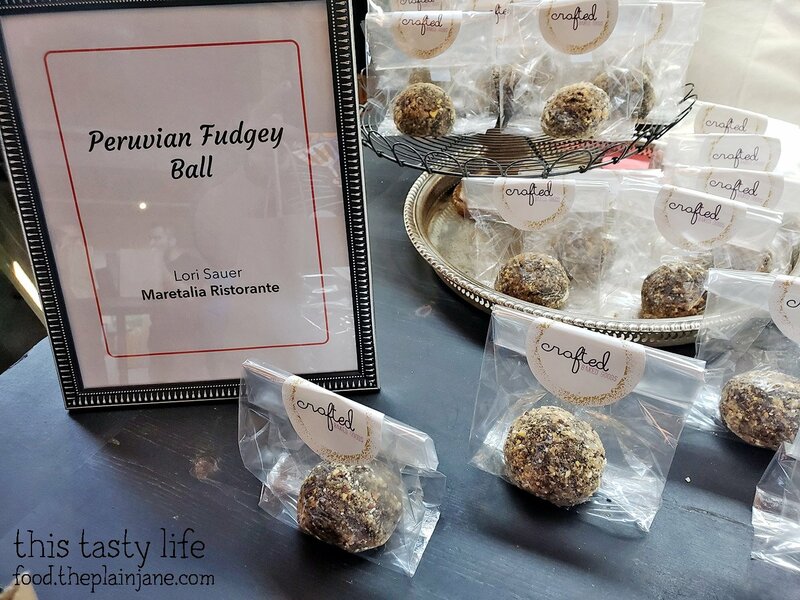 Peruvian Fudgey Ball! Looked like it was covered in nuts, maybe? My friend Faye from Faye’s Desserts was there and she had a couple of cupcakes inspired by her late mother. 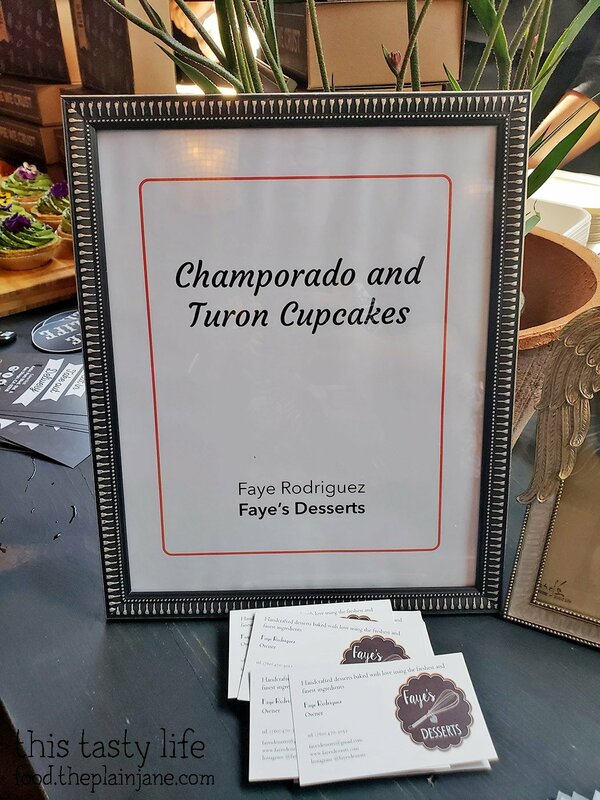 Champorado and Turon cupcakes! 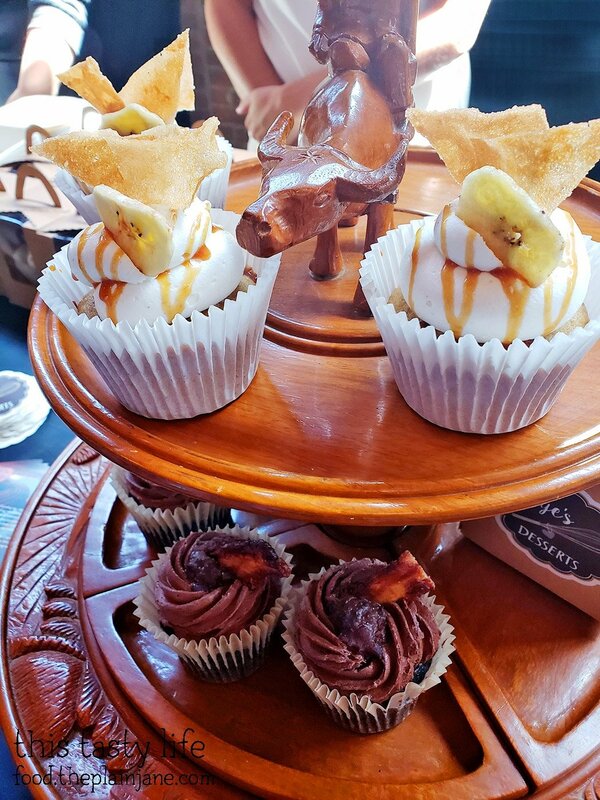 The turon (which is a banana lumpia) cupcake had a little bit of lumpia wrapper stuck on top – I thought that was so clever! And a banana chip so you know it’s banana. I remember my mom always eating banana chips growing up, too. 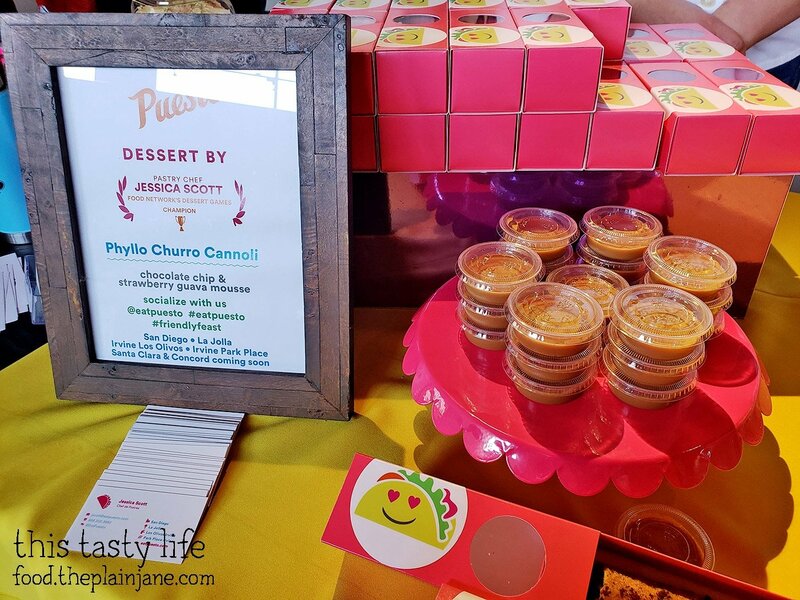 Pop Pie Co was present with a few goodies at the Chef Driven Bake Sale! 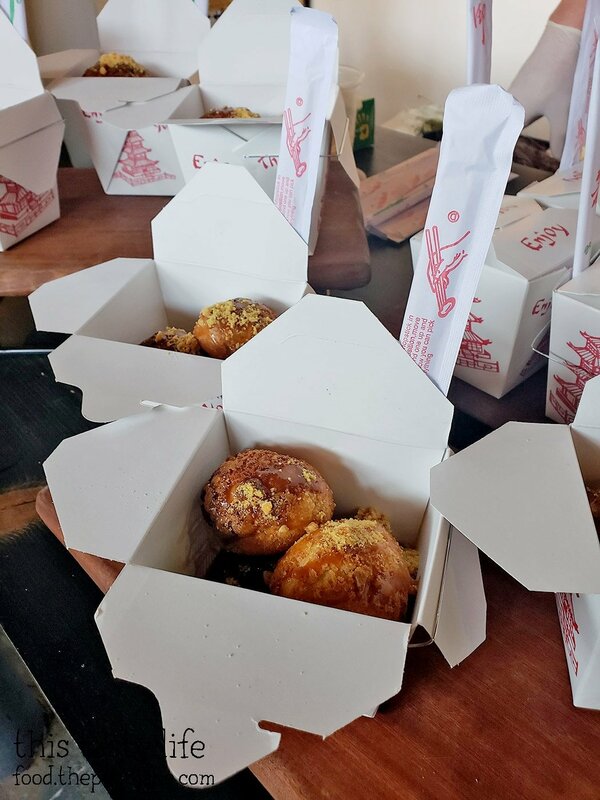 Way over on the left you can see a couple of mango stick rice pies. Those were gone pretty quick. 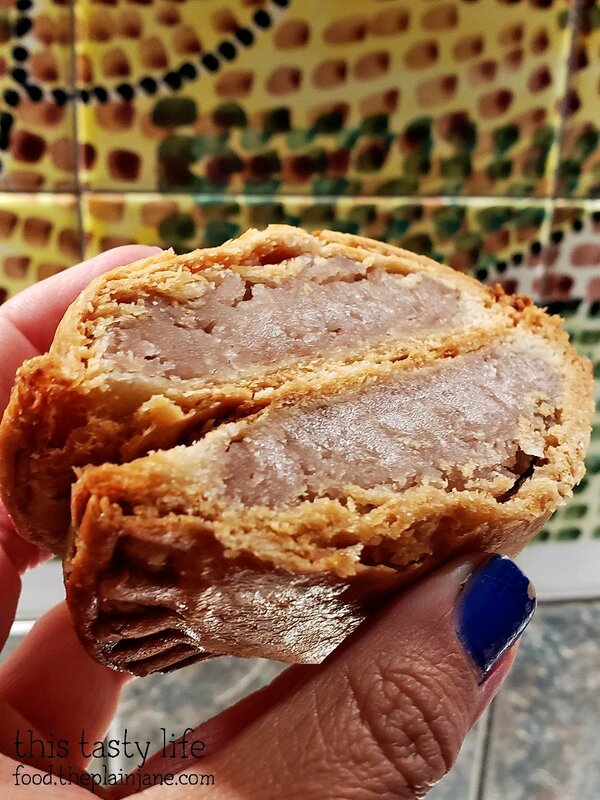 These are the taro hand pies. 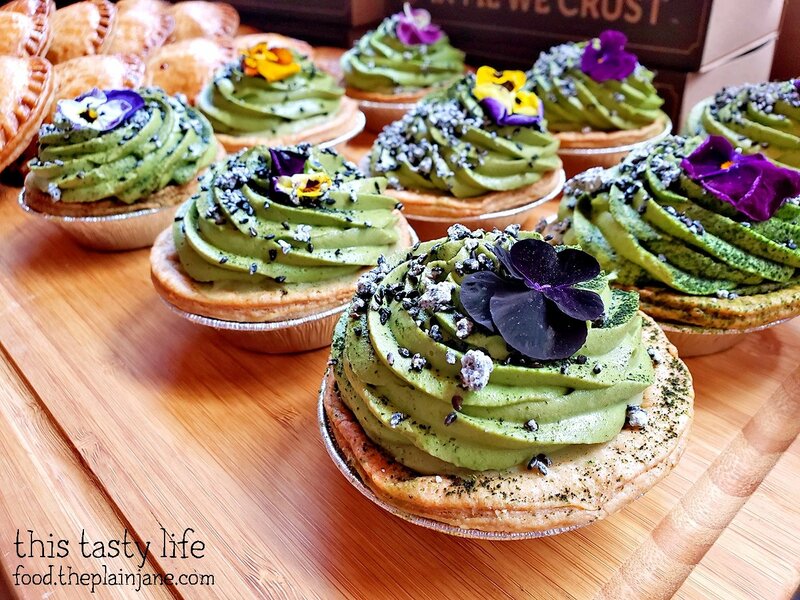 These matcha azuki bean pies were SO PRETTY with the dusting of flowers all over the top. But I don’t like matcha flavored things. I just like matcha as a drink so I knew this wasn’t the one for me, no matter how pretty it was. 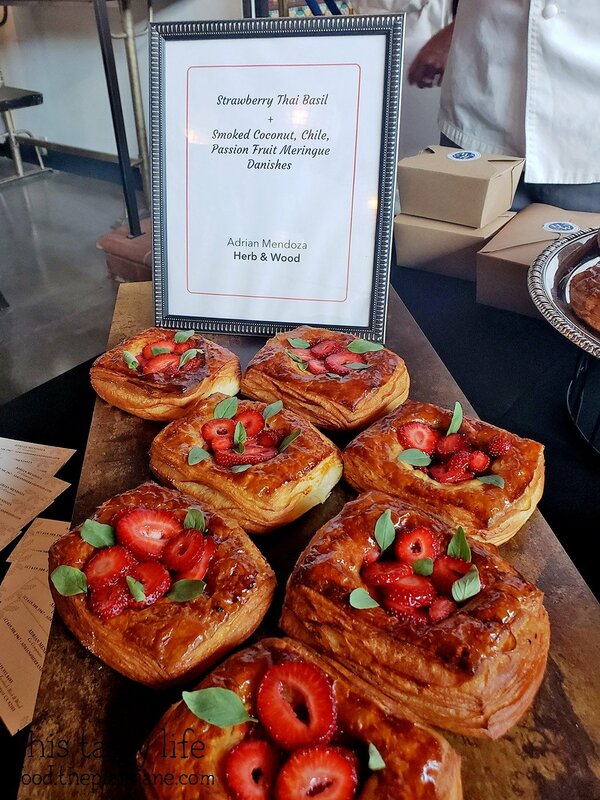 The fresh strawberries on top of these strawberry thai basil danishes from the chef at Herb & Wood looked SO GOOD. 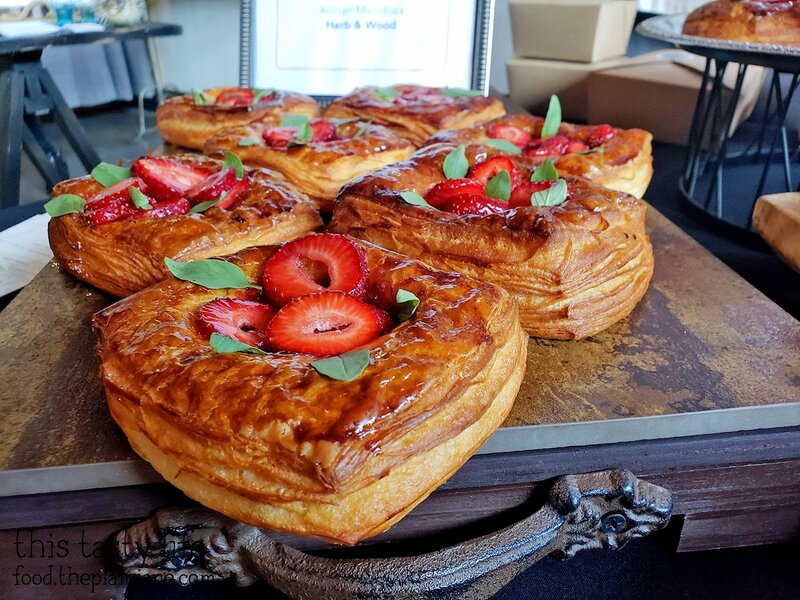 These crazy pretty danishes really caught my eye with it’s gorgeous presentation. 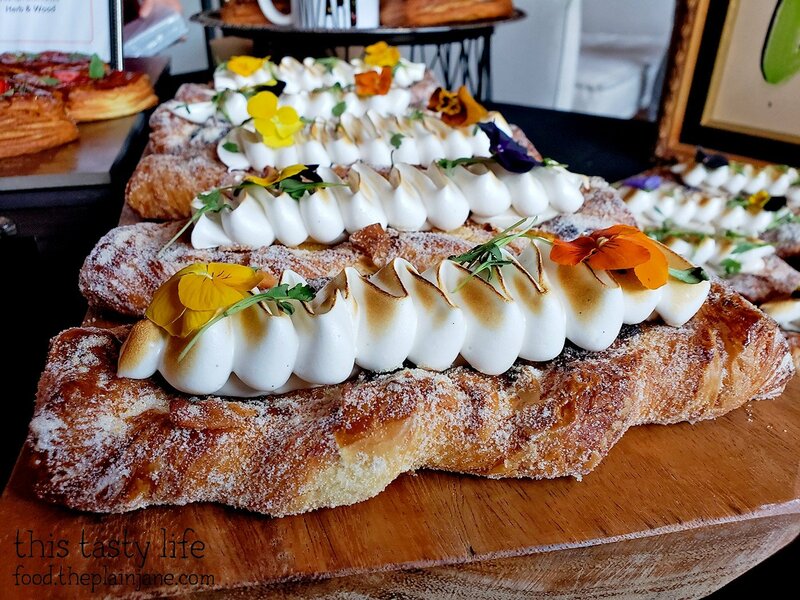 This one was a smoked coconut, chile, and passion fruit meringue danish. 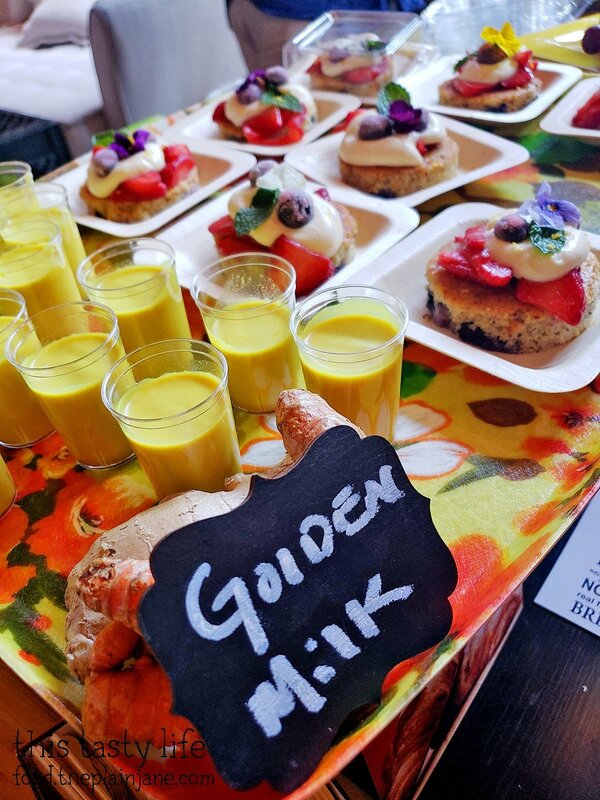 Not sure what was in the Golden Milk since I didn’t ask. I was in a rush, okay?! 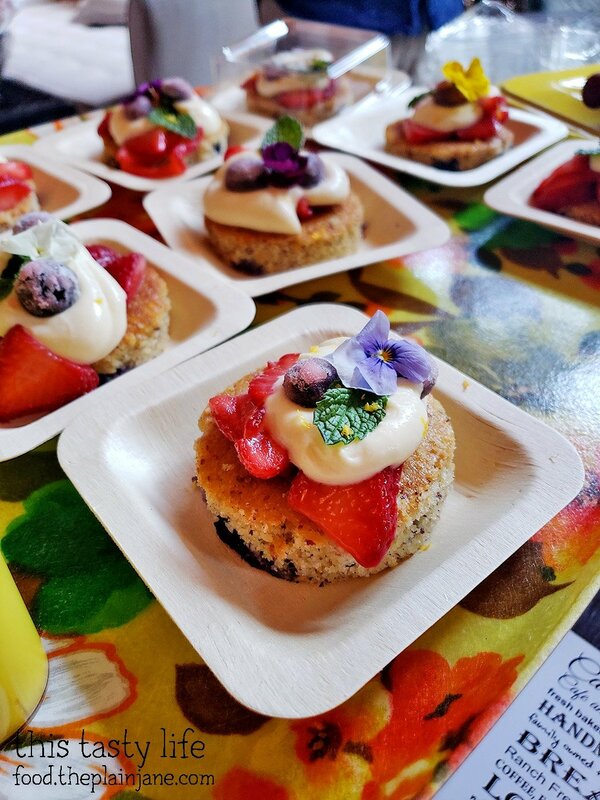 But right next to the Golden Milk were these pretty little plates of Whole Grain Berry Shortcake with Lemon Crème. I missed snapping a photo of the sign for this one so I’m not sure who made it! BLOGGER FAIL. 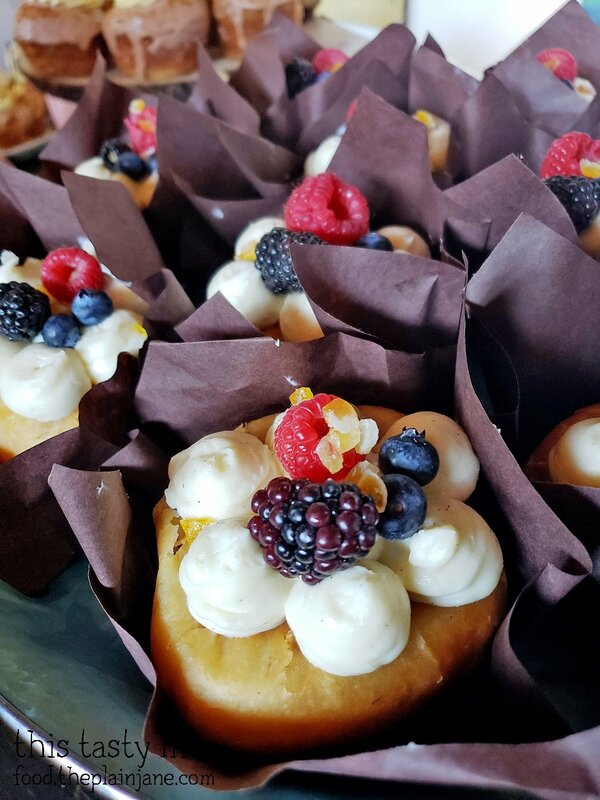 These are some yummy little Rum Babas. Love the fresh fruit on top! Again… didn’t snap a photo of their menu sign. I must have been too excited about seeing all of the pretty desserts. Next to the rum babas were these offerings from Le Parfait Paris. One was nutella and the other was maple raisin cinnamon. I loved that it was kind of like two desserts in one with the macaron on top! And that little detail of a tiny bit of gold leaf on top – so pretty! 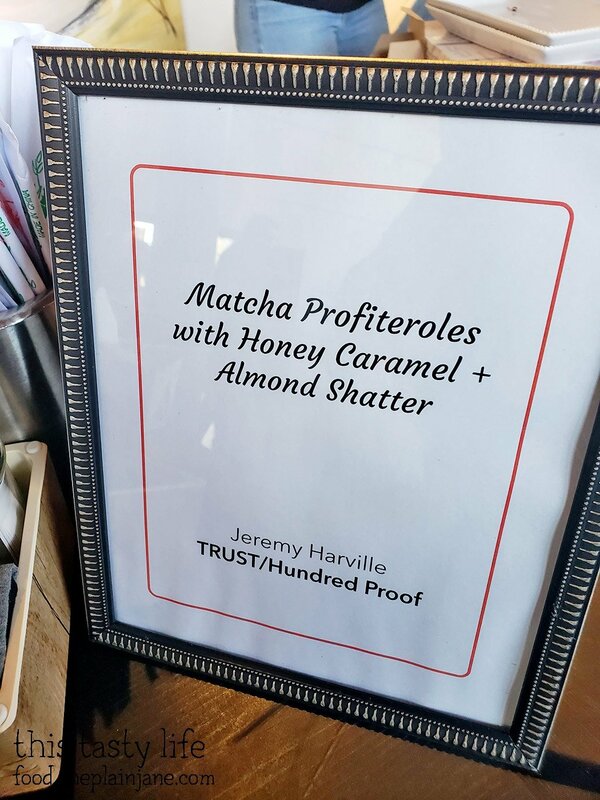 Next up: from TRUST/Hundred Proof! I got a kick out of the packaging for these Matcha Profiteroles! And they included chopsticks!! How cute! These looked so tempting and you got more than one but again – matcha… so tempting though. THE CHOICES WERE SO HARD TO MAKE. 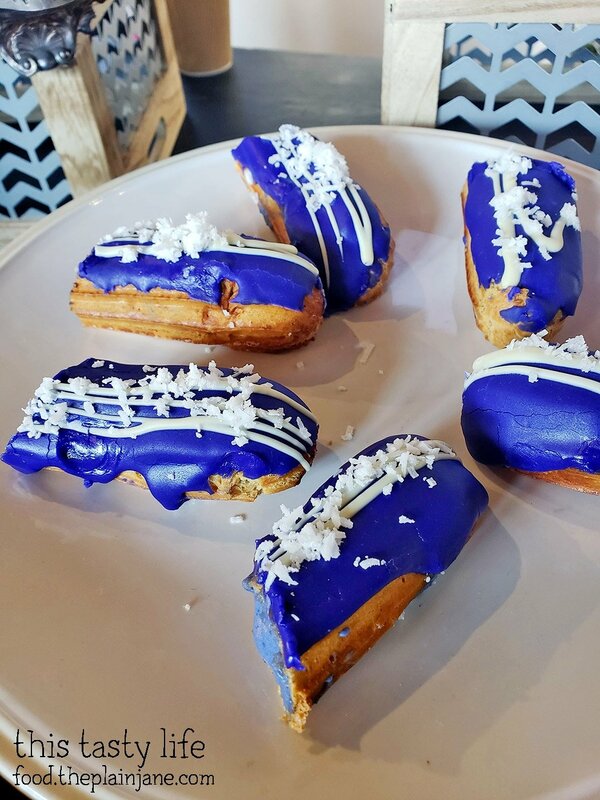 These ube and coconut eclairs were so pretty with their purple color. I was confused as to why these were cut on a plate though, and I thought maybe that meant you only got half an eclair. Which made me not want to get it. Puesto had a really amazing display and I loved their boxes! You got two types of churros and some caramel sauce with your cannoli. 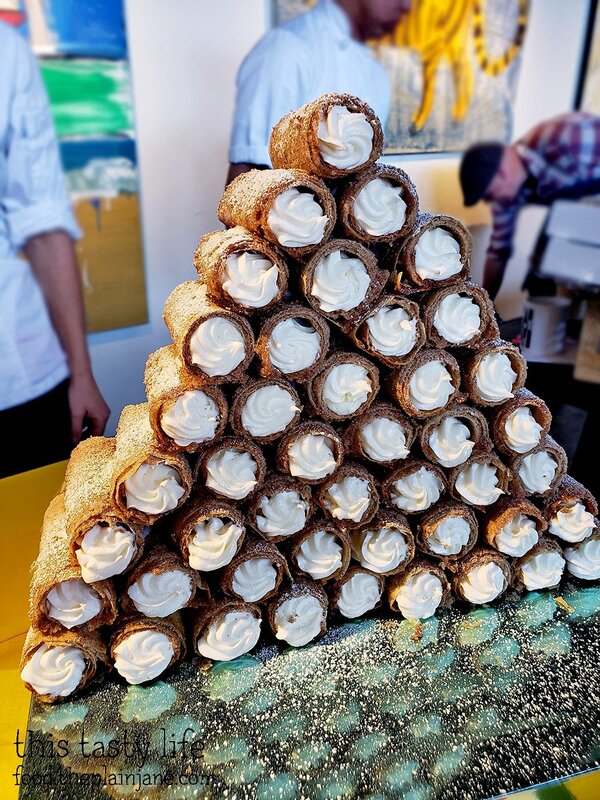 Tower of cannolis! The only reason I didn’t pick this one is I knew we weren’t going home right away and I didn’t think they would last in the car until the evening. 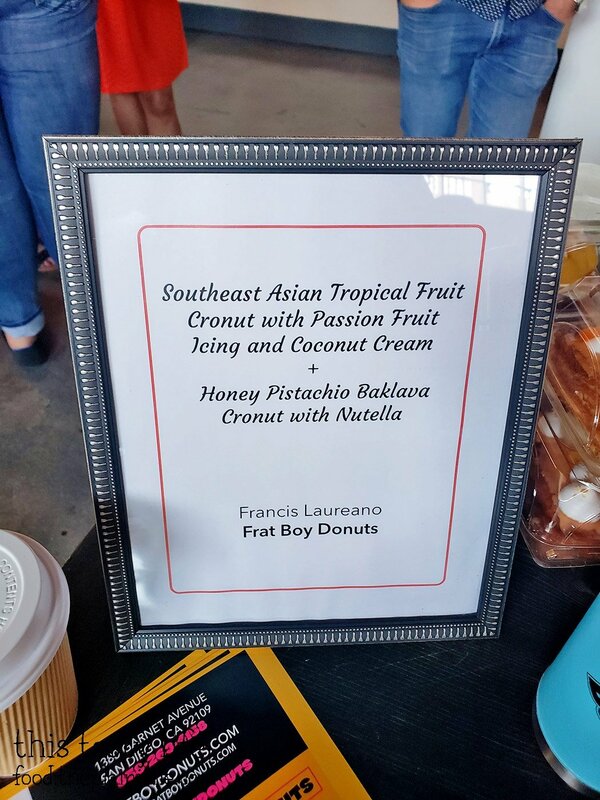 Donuts in the house from Frat Boy Donuts! 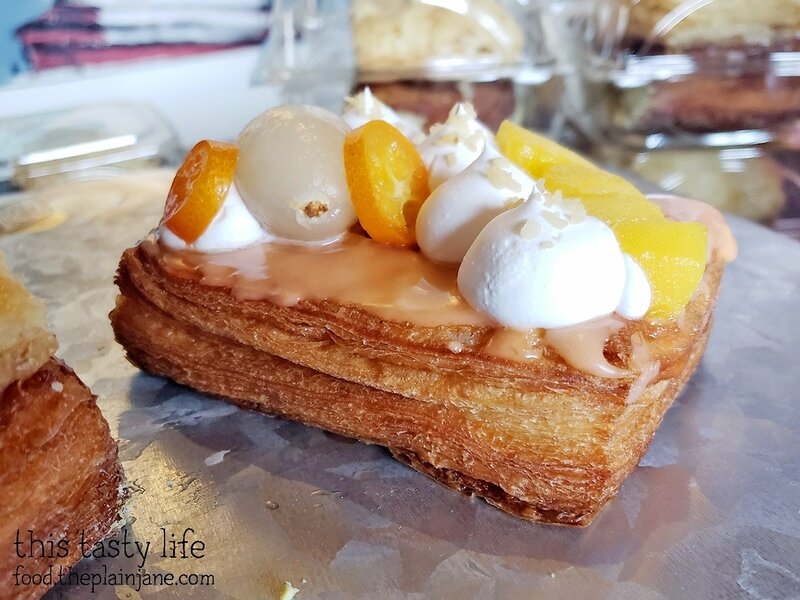 Tropical fruit cronut! Look at those layers…. damn. So what did I actually end up getting? Let’s see below! 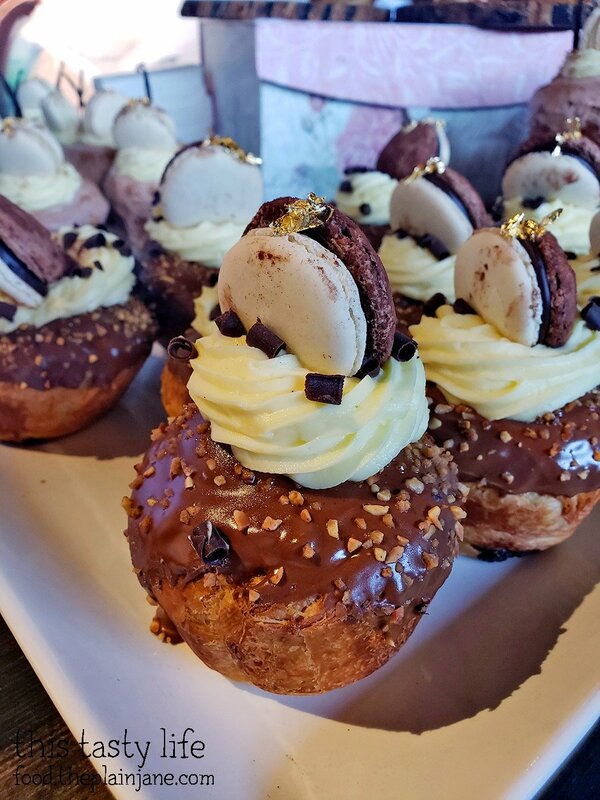 I don’t have a second photo of these nutella cruffins from Le Parfait Paris because by the time we got home, the frosting and macaron had fallen off and was all over the box. But that didn’t matter because the nutella cruffin still tasted AMAZEBALLS. 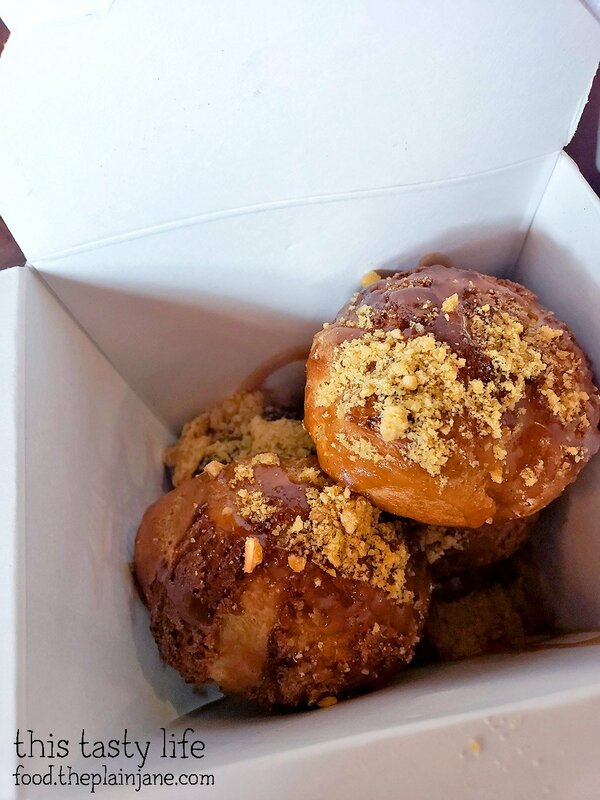 It had the perfect crunchy layered texture with some chewy bits in between with nutella swirled throughout the cruffin. The macaron had nutella INSIDE IT, too. One of my favorites of the five we ate! This one got a little ugly after transport, too, but it was still delicious! 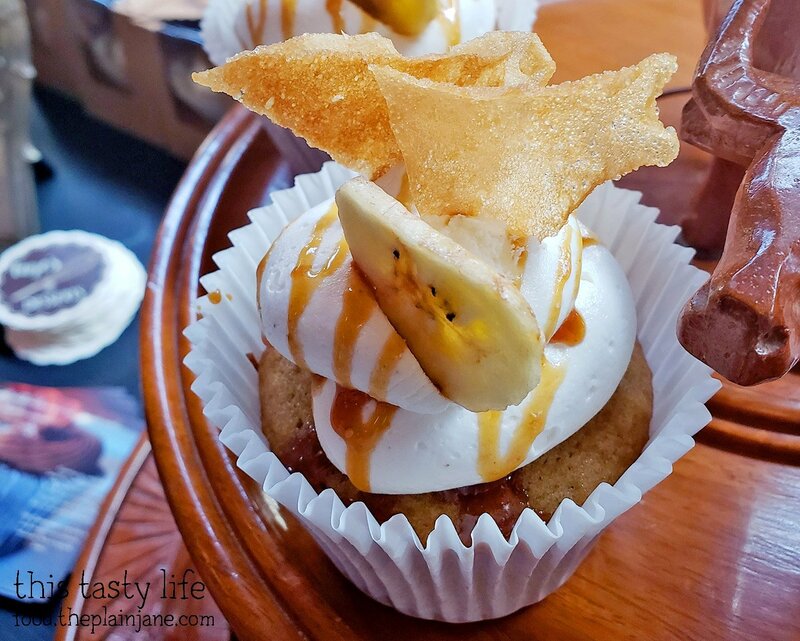 This is the Turon cupcake from Faye’s Desserts. I love love loved the lumpia wrapper on top. 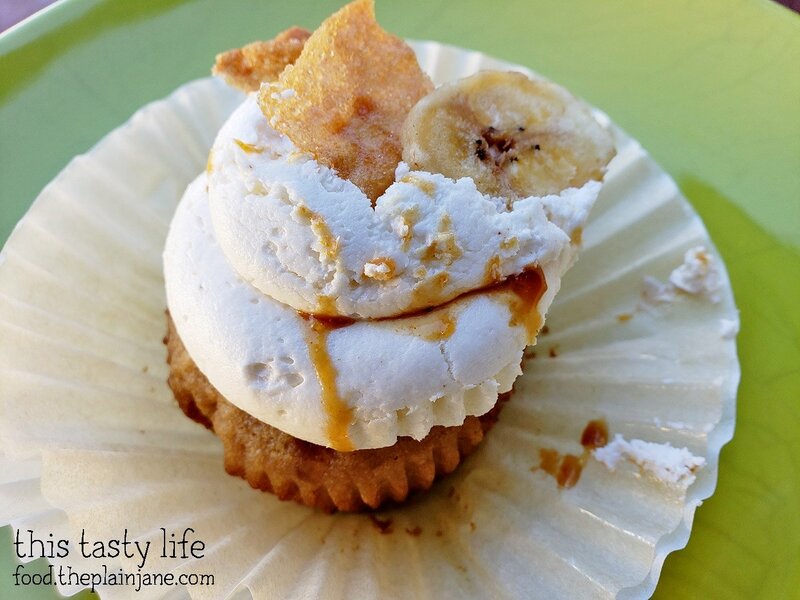 The middle filling was all banana – just like inside of turon! 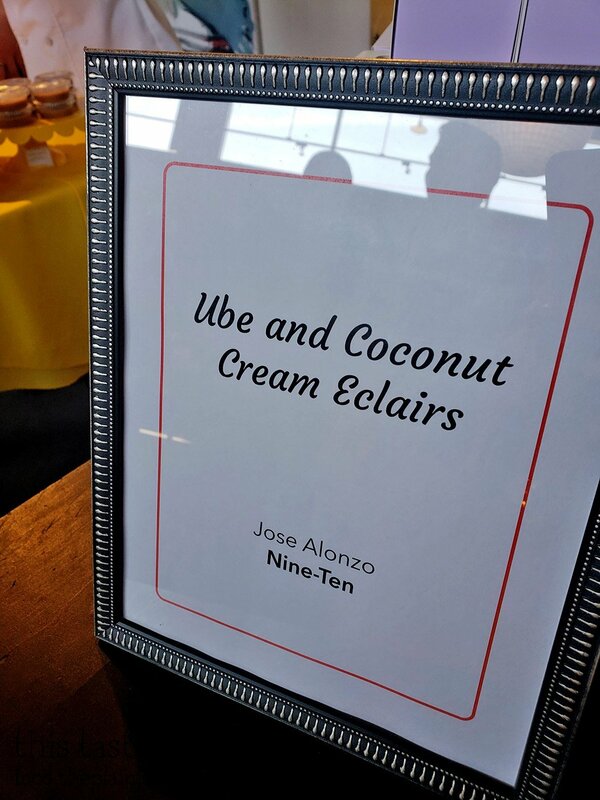 The cupcake was kind of muffin-like in my opinion so it wasn’t uber sweet – most of the sweetness came from the buttercream frosting which was a nice contrast. 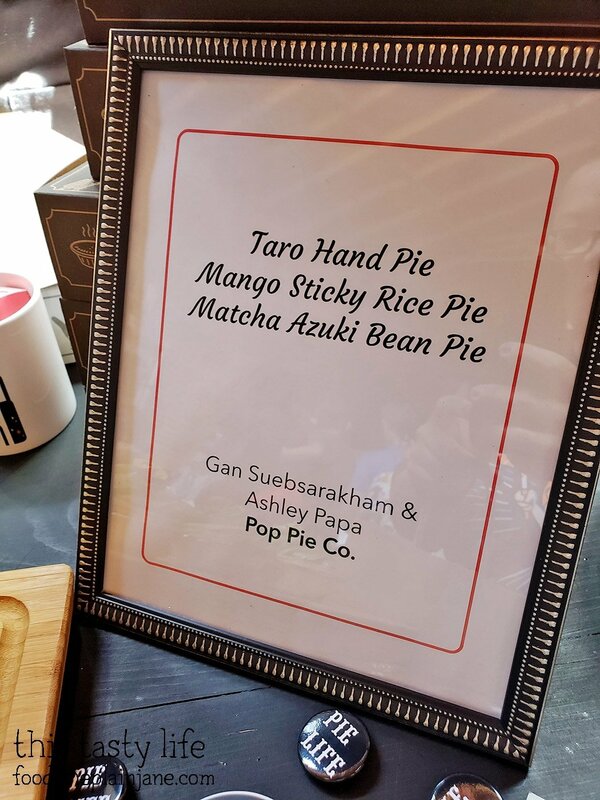 My third choice was the Taro Hand Pie. The crust on this was SCRUMPTIOUS. 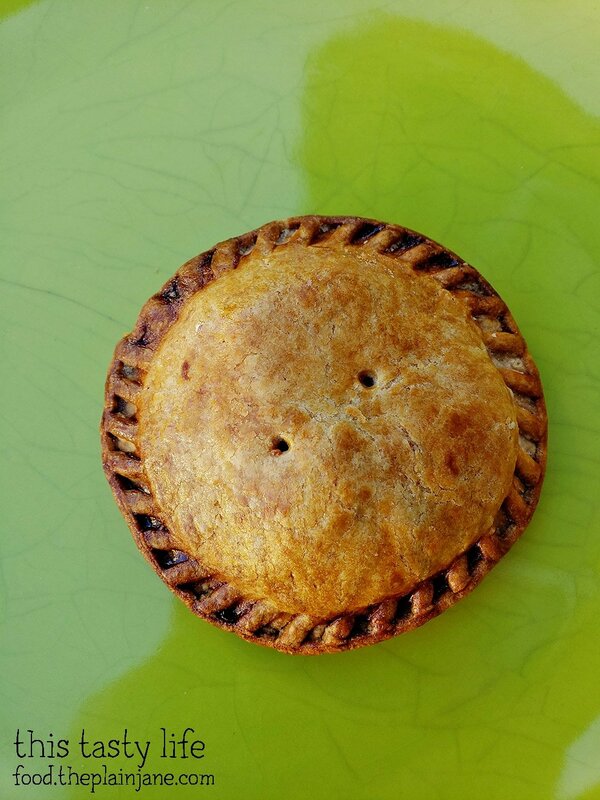 Pot Pie Co has amazing crust on their pies and this was no exception. The filling was delicious, too. 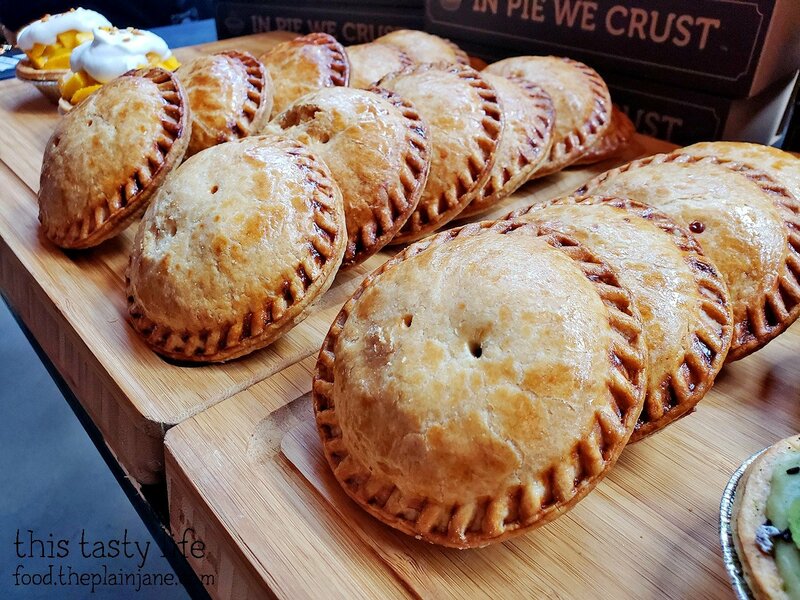 I loved the flaky crust with the yummy filling. 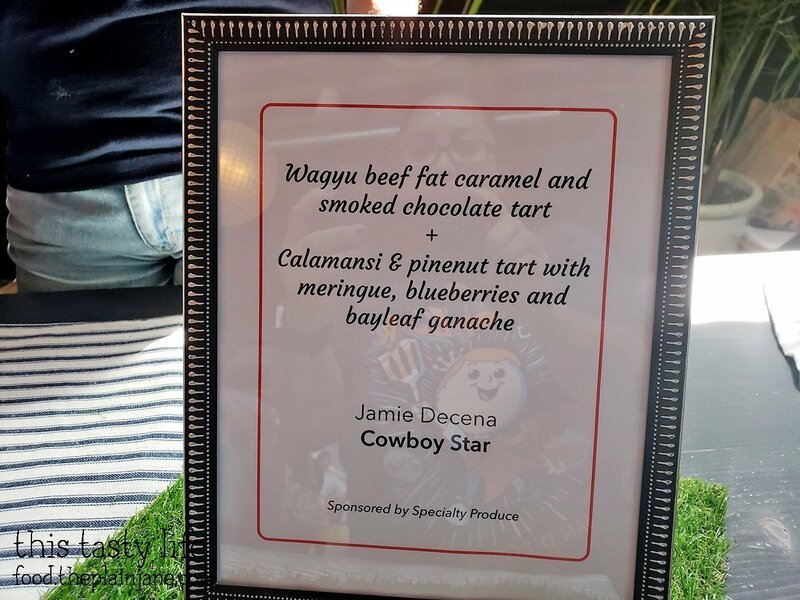 I also got the wagyu beef fat caramel & smoked chocolate tart from Cowboy Star. The popcorn got stale by the time I got home, but I figured that would be the case. This tart was INTENSE. Serious chocolate lovers only for this sucker. 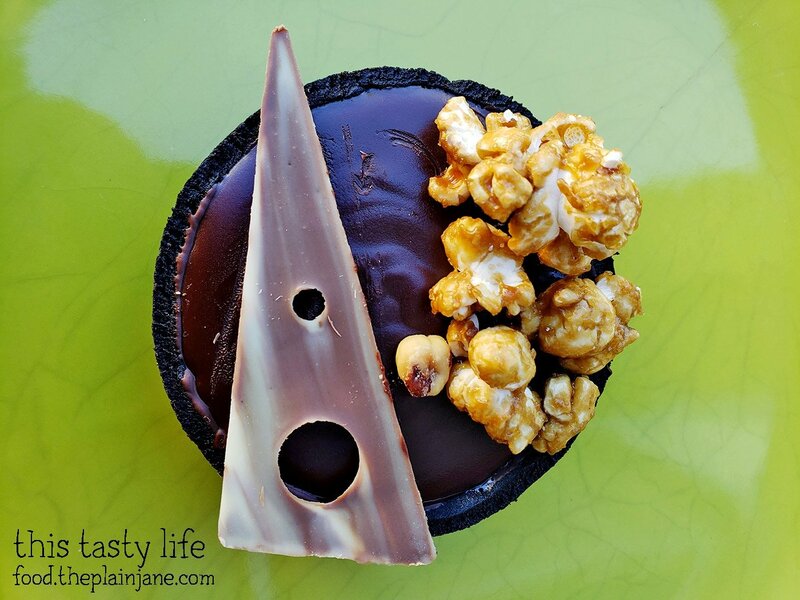 I liked the caramel and the smokiness of the tart but it was a really intensely dark chocolate flavor that was maybe a littttttttttle too much for me. But I loved the creativity of it! I got both treats from the Cowboy Star chef and this is the other one -a calamansi and blueberry pine nut tart! So pretty! Here’s a peek at the inside – you can see the blueberry layer on the bottom. 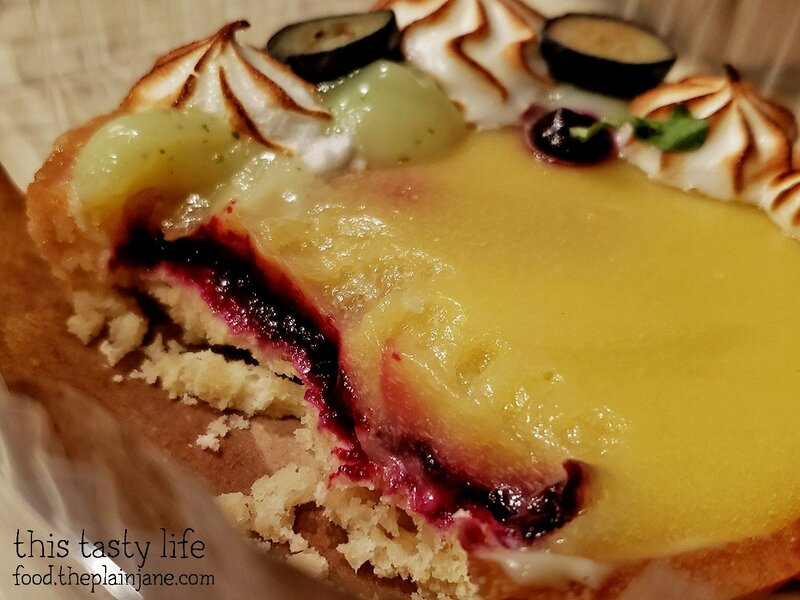 It tasted very much like a lemon or key lime tart – had that citrus tartness to it and the blueberry helped to offset it with a nice of sweetness. 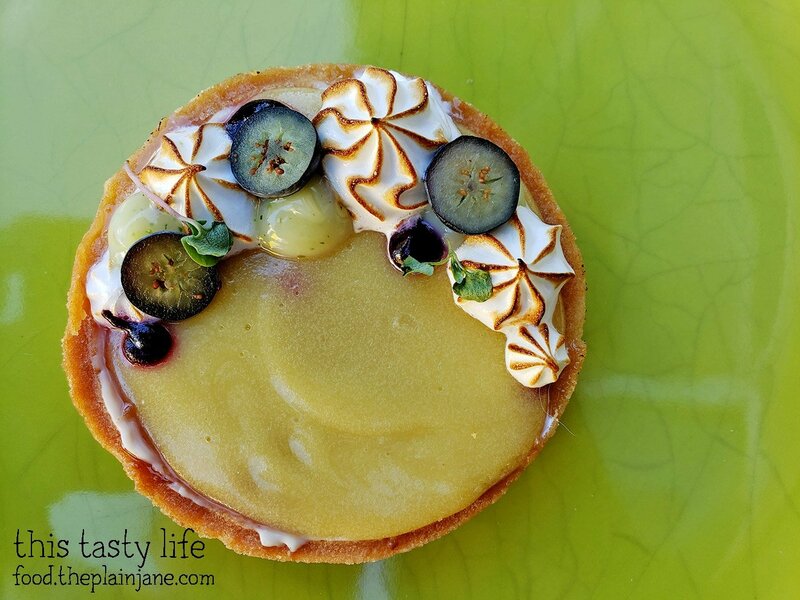 The tart crust was also amazing – buttery and delicious! Those were my five choices at the Chef Driven Bake Sale. 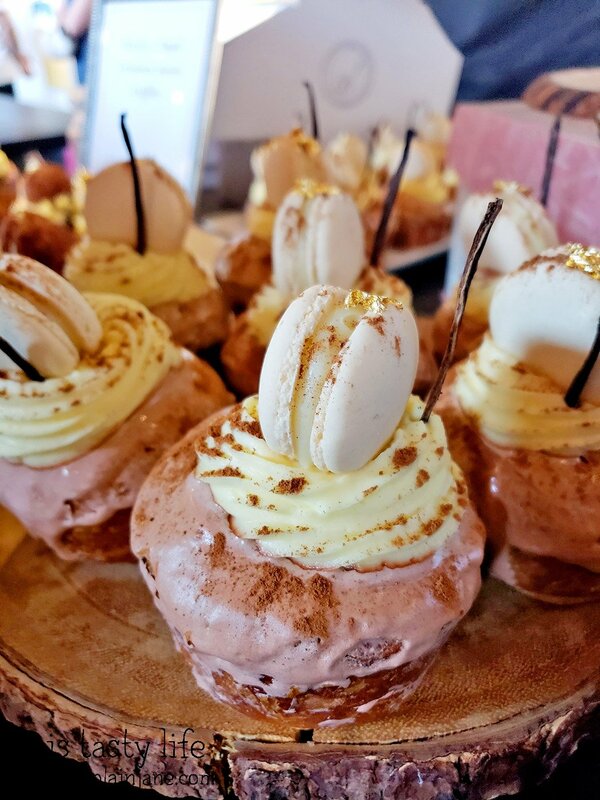 I think next year I would like to go all in and try all of the desserts and get together a group of friends and tasters to try them all together since I couldn’t eat all of them at once. What would you have chosen if you could only pick five? Ooh take me next year! It looks like such a hard decision to pick out only five! 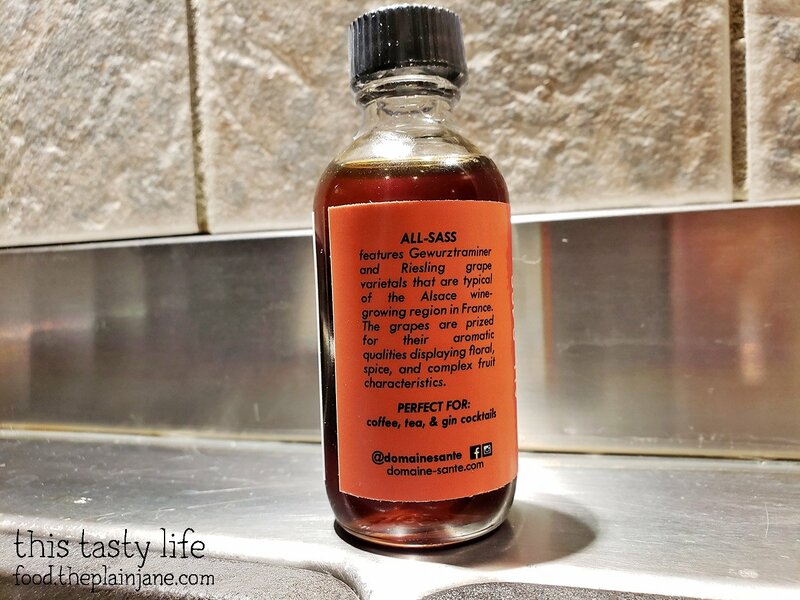 I only like dessert in tiny doses so sharing would totally work for me. Okay, Lynn, you’ll be in my tasting group for next year!